The next four Botany Photo of the Days are courtesy of Hannes Dempewolf, a graduate student in Botany, and Paul Bordoni, a member of the Global Facilitation Unit for Underutilized species. The photo and write-up are provided by the GFU. The GFU’s mission is to “Promote and facilitate the sustainable deployment of underutilized plant species to increase food security and alleviate poverty among the rural and urban poor”. Photo credit is courtesy of Clive Boursnell / Bioversity International (see comments below). An unintended consequence of the green revolution has been a massive reduction in the number of species and diversity of crops. This process of crop replacement is a threat to local and global food security because the replaced indigenous crops often are essential for low input agriculture, have unique nutritional and cultural value, and contain a diversity of locally adapted genotypes with resistance to a wide array of biotic and abiotic stresses. Global climate change and degradation of once-productive lands have further heightened the demand for crops that perform well in harsh and/or changing environments. Research on neglected and underutilized species is needed to work towards a sustainable solution for increased food security and poverty alleviation as stated in the United Nations Millennium Development Goals. Emmer wheat is one of the three hulled wheats known in Italy as farro. It is a low-yielding awned wheat, and was one of the first crops domesticated in the Near East. Once widely cultivated in the ancient world, it is now a relict crop in marginal mountainous regions of Europe and Asia. Its value lies in its ability to give good yields on poor soils, and its resistance to fungal diseases such as stem rust that are prevalent in wet areas. Its main use is for human food, though it is also used for animal feed. In recent years, farro has been enjoying a resurgence in popularity among gourmets and the health-conscious, who sing the grain’s praises for its high nutritional value and adore the hearty, flavorful taste of the “Pharaoh’s Wheat”. Rich in fiber, protein, magnesium, and vitamins, emmer contributes to a complete protein diet when combined with legumes, making emmer grains and pastas ideal for vegetarians (or for anyone simply looking for a plant-based high-protein food source). Emmer is grown in Morocco, Spain, the Carpathian mountains on the border of the Czech and Slovak republics, Albania, Turkey, Switzerland and Italy. 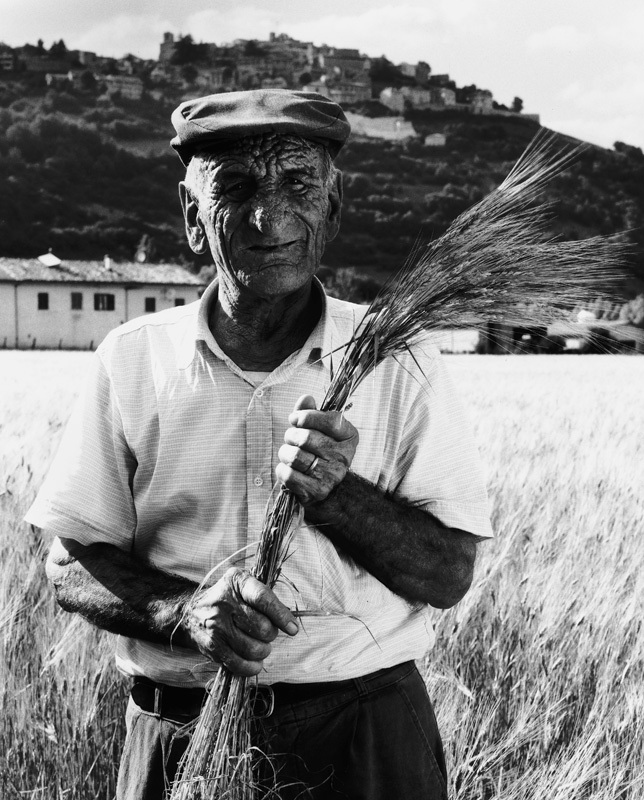 Italy is an interesting case as, uniquely, farro cultivation is well established and even expanding. In the mountainous Garfagnana area of Tuscany, farro is grown by farmers as a GI (Geographical Indication (also see: Relevance of geographical indications and designations of origin for the sustainable use of genetic resources (PDF))), with its geographic identity protected by law. Production is certified by a co-operative body, the Consorzio Produttori Farro della Garfagnana. GI-certified farro is widely available in health food shops across Europe, and even in some British supermarkets. The demand for Italian farro has led to competition from spelt, a non-certified farro, grown in lowland areas. Wild emmer wheat is the immediate progenitor of tetraploid and hexaploid cultivated wheats. It is recognized as a source of genes for agronomically important traits. These include genes for large spike and grain size, high grain and protein yield, desirable composition of storage proteins, photosynthetic yield, herbicide response, salt tolerance, disease resistance, profuse tillering, drought tolerance, and, presumably, genes for other quantitative traits. With the advent of, and easy access to, molecular genetics and breeding tools, wild emmer wheat is expected to contribute the full range of its diversity, in qualitative and quantitative traits, for a more sustainable wheat production, especially in the developing world. It is also valuable for its contribution in the safeguard of biodiversity. Yes! I applaud UBC and BpotD for highlighting these issues! As climate change and the end of cheap oil require “more local” and “more resilient” solutions to almost everything, many regular folks saving and selecting open grown seed will certainly reemerge as a basic survival strategy of our species. Plus, many heritage varieties of food plants are gorgeous and have fascinating stories! What a wonderful photo and article this is. There is such diversity in the plant world and especially now, we definitely need to aquaint ourselves with some of the much lesser known species that are out there. Last year I grew Kamut just for ourselves, will be trying this wheat this year! Thank you BPotDay for bringing this to the forefront! Thanks for the links George! Max’s post reminded me that if you dub around on the “Hertage Wheat, etc” site above you’ll find seed from some of the rare wheats are for sale. The more folks cultivating the safer the variety. for folks to restore, a veritable Noah’s Ark of biodiversity!